It's refreshing to see an artist select an existing genre not out of familiarity or nostalgia, but as a specific aesthetic tool. 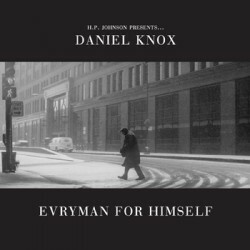 Daniel Knox adopts the Randy Newman school of songsmithery to construct a highly theatrical irony, infusing the innocent and dated sound with often obscene lyrics and a lot of attitude. Evryman For Himself is a fascinating little gem of a record that raises real questions of genre while entertaining all the while. Like Tom Waits, Knox excels at--and delights in--creating twisted characters to play out the drama of his songs. Evryman delivers quite a cast: we've got murderers, rapists, aging perverts and vengeful ghosts, to name a few. All are rendered so lovingly and often with so much humor that it's hard not to sympathize with them. Knox is deft in the language of misanthropy, a gleeful villain. The sensation of hearing filthy scenarios played out by a cheery, piano-playing lounge singer makes for a pleasant discomfort. "Debt Collector" carries an especially potent irony. It's a jubilant tune of psychopathy, uptempo and catchy, sung from the perspective of a caustic individual who makes sure to collect violently on what he's owed. Sometimes the humor is a little more obvious: on the album's title track, Knox follows the line "hopes and dreams will end up killing you" with a kazoo solo. Either way, it's all delivered so well, in perfect rhyme and confident voicing. Knox is both a capable painter of the grotesque and an eager comedian. But the album is not without its moments of sincerity and gloom. There's real feeling on "Slowly" in its mournful simplicity, enough to make us wonder if there's no mask at the front of it. "If you have to take it away, do it slowly," Knox croons over gentle piano and melancholy cello. The album's opener and first single "Ghostsong", meanwhile, illuminates a tortured phantom's plans for revenge. Knox adorns softly echoing piano chords with his richly timbred voice, breaking into a chilling falsetto at the chorus. It's by far Evryman's best track, strange enough to levitate away from the genre of piano-men of days past into something uniquely Knox. His adoption of genre is a brave and successful endeavor, but it's "Ghostsong" that proves he's capable of creating a voice of his own. Evryman For Himself is a careful discourse on genre, intelligently wrought by a skillful artist. As uncomfortable as it is rewarding, it's a standout sophomore album worth consideration by listeners of all genres. The record will be released via La Société Expéditionnaire on May 10th. Until then, you can catch Daniel Knox at the Hideout on Thursday, April 14th. The "Ghostsong" single is also currently available for purchase from iTunes.